The client sends a write request to the server, specifying the name of the file. The server sends back an acknowledgment. Since this acknowledgment is prior to the receipt of any data, it uses block number zero in the acknowledgment. The client sends a data message containing block #1, 512 bytes of data. The server receives the data, sends back an acknowledgment for block #1. The client sends block #2, 512 bytes of data. The server receives the data, sends back an acknowledgment for block #2. The client sends block #3, containing 176 bytes of data. It waits for an acknowledgment before terminating the logical connection. The server receives block #3 and sends an acknowledgment for it. Since this data message had fewer than 512 bytes, the transfer is done. The client receives the acknowledgment for block #3 and knows the file write was completed successfully. This example shows the client sending the same 1,200-byte file to the server that it read in Figure 293. 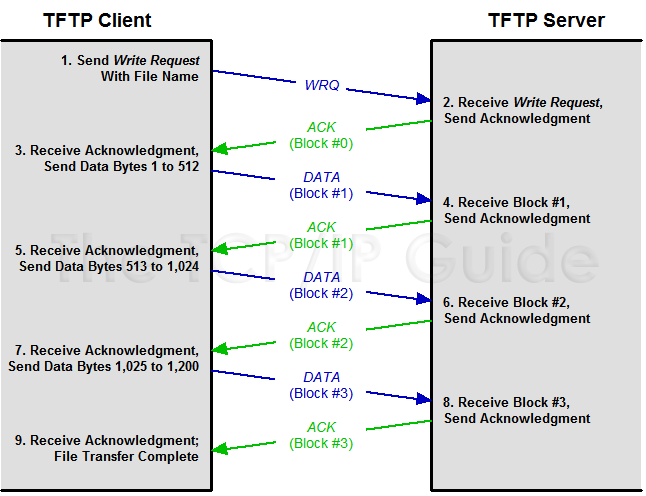 The client sends a write request to the server, which acknowledges it; it uses block #0 to represent acknowledgment of the request prior to receipt of any data. The client then sends blocks of data one at a time, each of which is acknowledged by the server. When the server receives block #3 containing fewer than 512 bytes of data, it knows it has received the whole file. Key Concept: A TFTP read operation begins with the client sending a Read Request message to the TFTP server; the server then sends the file in 512-byte Data messages, waiting after each one for the client to acknowledge receipt before sending the next. A TFTP write operation starts with a Write Request sent by the client to the server, which the server acknowledges. The client then sends the file in 512-byte Data blocks, waiting after each for the server to acknowledge receipt. In both cases there is no explicit means by which the end of a transfer is marked; the device receiving the file simply knows the transfer is complete when it receives a Data message containing fewer than 512 bytes.